Prototype of EPI at center-left of image. Credit: Roger Raman. Scientists seeking to capture and control on Earth fusion energy, the process that powers the sun and stars, face the risk of disruptions—sudden events that can halt fusion reactions and damage facilities called tokamaks that house them. 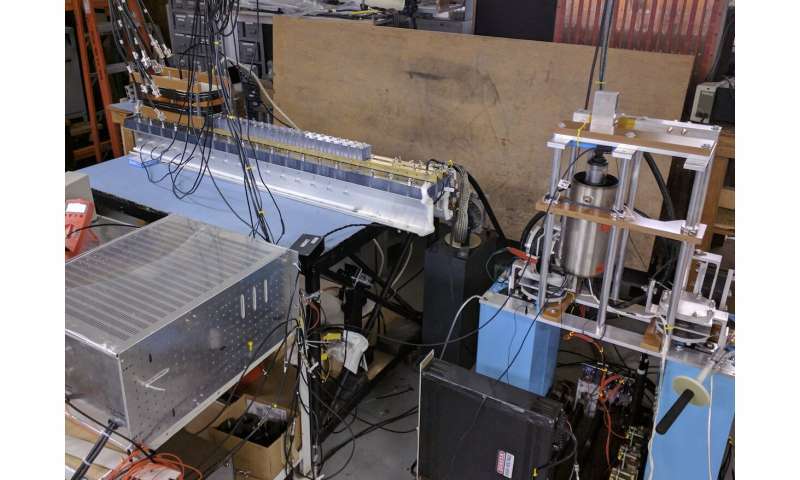 Researchers at the U.S. Department of Energy's (DOE) Princeton Plasma Physics Laboratory (PPPL), and the University of Washington have developed a novel prototype for rapidly controlling disruptions before they can take full effect. This process may prove faster and may allow payloads to penetrate more deeply into the plasma than today's most developed techniques. Current systems release pressurized gas or gas-propelled shattered pellets using a gas valve into the plasma, but with velocity limited by the mass of the gas particles. "The primary advantage of the EPI concept over gas-propelled systems is its potential to meet short-warning time scales," said Roger Raman, a University of Washington physicist on long-term assignment to PPPL and lead author of a Nuclear Fusion paper that describes the new system.